Arlington Industries, Inc. was founded in 1949, and in its early years served the electrical industry as a regional supplier of zinc die cast fittings. The company was acquired by its present owners in 1956. Since, Arlington has become a leading manufacturer of traditional metallic and non-metallic fittings and connectors - while remaining an industry leader in the development of unique and innovative electrical and communications products. Today, Arlington makes more individual zinc die cast line items than anyone else, and we're still the only independent electrical fittings manufacturer with injection molding capability for producing non-metallic fittings in-house. We are also firmly committed to new product development. We monitor the industry closely to develop products that offer very specific, but innovative solutions to jobsite problems and situations. Our commitment is easily recognized by the more than 400 new or unique products we've introduced since 2003. 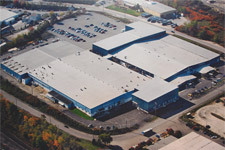 After multiple plant expansions, our Scranton, Pennsylvania facility now encompasses 5 acres under roof. Arlington products are available throughout the US and Canada through stocking sales representatives, who support distributors' inventory. Arlington has protected virtually all its unique and innovative products with both domestic and foreign patents.